On January 17, 2014, Joelle started a Kickstarter project to help finance Magic Peas and Two Front Teeth, her newest children’s picture book. As well, she developed a companion activity book that will be offered. Please follow this link to visit the Magic Peas Kickstarter project, and please, share this project with your friends. There are great rewards, so please, make a pledge to this project. Many of the pledges will get your name listed in the book and here on this website in the Magic Peas Thank You Garden. Even if you don’t have young children, there are wonderful rewards for pet parents to have their cats and dogs painted into the book. Or help your community by pledging to a level such as the “Basket of Cherries,” and bring some magic peas to others by donating the books to your local library or school. 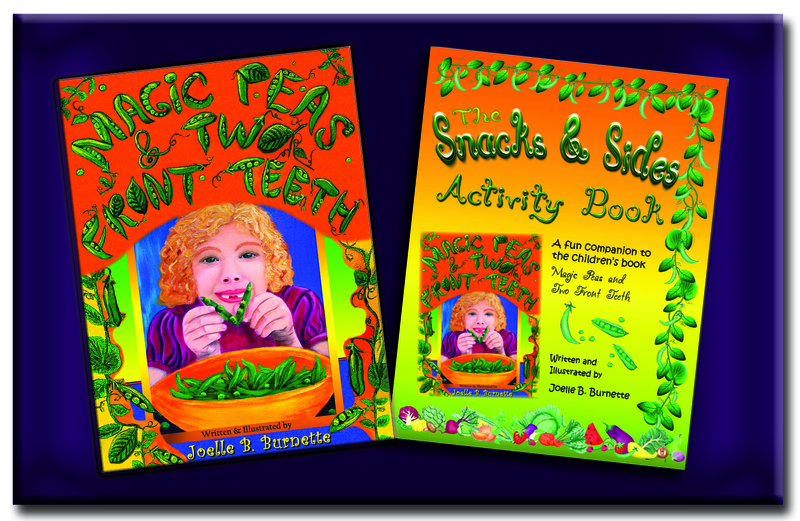 The Magic Peas story is a sweet tale about a finicky eater who loses her baby teeth, then learns to enjoy healthy snacks while eagerly awaiting her new teeth to grow in. This is a great story for any finicky eaters, but also, it’s a fun way to encourage all children to choose healthy foods. Joelle illustrated the Magic Peas story with 20 vibrant oil paintings, and the success of this Kickstarter project will allow the book to be printed as a beautiful, keepsake hardcover first edition. As well, the Snacks and Sides Activity Book will become a paperback with more than 100 pages brimming with full-color activities, all focusing on healthy snacks and side dishes.